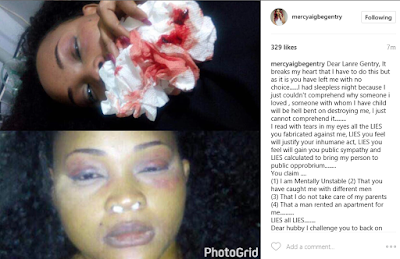 Mercy Aigbe opens up! reveals her husband constantly beat her,dares him to release proof of her infidelity! Her husband has been the only one speaking to the press about their marital problems,well until now. He granted an interview yesterday where he said Mercy was unstable,a cheat and that another man got her the apartment she moved into after she packed out of their home. Mercy has now broken her silence sharing images of her bloodstained face after he battered her she said..
Hmmmm lanre you forget quickly!...., you forget how I have labored and stood by you all these years, even tho all what I was getting from you was constant beating, harassment ,threat to my life and threat to destroying my image if I dare,leave you...... .,,You must PROOF all your allegations otherwise God knows I am going to add another lawsuit to the one on ground!!!!!!!!!!!!!!!!! Although my Team has been pleading with me to stay silent all these while, but I have come to realize that you want to ride on my keeping mum...... #saynotodomesticviolence #realmendonthit #mylifeisnotinyourhands"
For the kids involved,We do hope they can settle this in a civil manner.